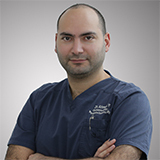 Dr. Ahmad Fakih is an Obstetrician and Gynecologist with an emphasis in Reproductive Endocrinology and Infertility. He attained both his medical degree and his specialty degree from the American University of Beirut. During his training, he was awarded the BEST Teaching Resident award. He was also the president of the Resident Staff Quality Council. Since joining Fakih IVF he has treated over 2000 infertile couples with high successful rates of pregnancy, and amassed a wealth of experience. He also managed 1000’s of pregnant women and successfully delivered them. His interests lie in treating the most challenging and complex infertility problems; (recurrent IVF failures, implantation failures and decreased ovarian reserve). His best days at Fakih IVF are seeing his patients' fertility journey come to an end. He is highly qualified to treat all Infertility issues and perform all necessary surgical procedures. Dr. Ahmad provides personalized patient care, aimed at making the fertility treatment period as stress free as possible for the couple. Personality: Dr. Ahmad understands the hardships, stress, and the emotional and psychological drain patients feel prior to coming in for treatment. Every patient is given his personal phone number and he is always a phone call away. Dr. Ahmad is a firm believer that the patients overall sense of well-being is vital to her success in the journey of fertility. "Intimate partner violence in a Lebanese population attending gynecologic care: A cultural perspective"
"Day 3 biopsy and day of transfer"